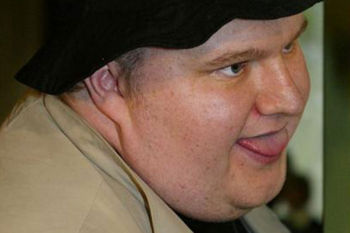 A new ruling may keep Megaupload founder Kim Dotcom from being extradited to the US. Back in January, Kim Dotcom, founder of Megaupload, had his mansion raided and hard drives seized as part of the US Government's drive to prosecute the alleged internet pirate. The US Department of Justice was very, very keen to see him in an American court, but a ruling from a New Zealand judge may have put the brakes on this rush to justice. It says that the raid on Dotcom's mansion was without basis, therefore the search and seizure of Megaupload hard drives that followed was illegal. Justice Winklemann added that, in her view, it was "clear that the police, in executing the warrants, have exceeded what they could lawfully be authorized to do." She also said that the New Zealand police were wrong to hand over cloned copies of Dotcom's hard drives to the FBI. The Feds apparently whisked the drives out of the country as quickly as they could, in contravention of an explicit directive that said any items seized were to remain in the possession of the NZ Commissioner of Police. Dotcom said, in a statement issued after the ruling, that he was very happy with the result. "We are digesting and analysing Justice Winklemann's judgment, and considering our next steps." Given the nature of the ruling, it now seems unlikely that Dotcom will face extradition to a US court. On Friday, his lawyers will argue in Virginia federal court that the DoJ case should be thrown out, as the US has no jurisdiction over foreign corporations such as Megaupload.